PSD have supplied equipment to a variety of projects that fall in to the soil washing category. Removal of contaminated fines, removal of lead shot, removal of hydrocarbons and the washing of oil contaminated ballast. Between October 2009 & July 2010, PSD supplied an SM400DP desander, an SU300DP desilter, high capacity S5-1-G centrifuge with flocculation system, lamella plate concentrator and sedimentation tanks to VHE Construction to work downstream of their own primary screening equipment. The equipment was used as a soilwashing plant to clean up a 335 hectare contaminated industrial site for use as the Athlete's Village for the 2014 Commonwealth Games in Glasgow's East End. The Village will house 6500 athletes and is due for completion in January 2014. In 2008, PSD supplied an SM250DP desander, SU10DP desilter, flocculation mixing and dosing equipment with sedimentation tank and an S4-1-H co-current centrifuge to VHE as part of the soil washing plant for the Bristol Arena. Around 36,000 m3 of hydrocarbon contaminated soil was "washed" and the wash water was flocculated and centrifuged to allow it to be re-used. PSD supplied equipment and personnel to carry out the washing of contaminated land excavated from the former Woolwich Arsenal (London, UK) to enable the site to be decontaminated in preparation for residential and commercial use. 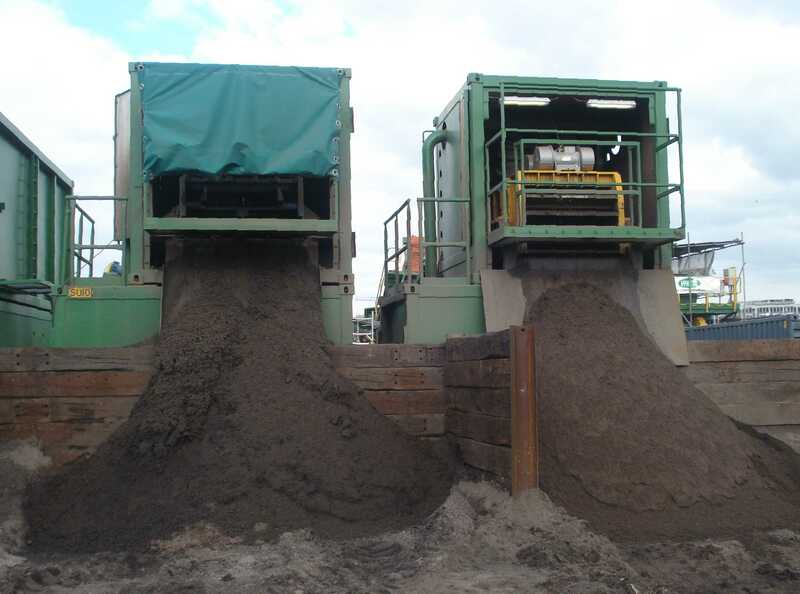 The process involved excavation of contaminated land to a depth of approximately 2m, washing of the excavated solids, testing the washed solids for contamination, returning cleaned solids as fill and disposal of failed solids as controlled waste. The wash water was flocculated and centrifuged for re-use in the soil washing process. The specification used ICRCL Guidance Note 59/83 (2nd edition July 1987) trigger concentrations as the criteria for determining contamination levels. The plant supplied by PSD included desanding equipment, desilting equipment and a flocculation plant complete with mixing system, sedimentation tank and high capacity S4DP centrifuge. PSD provided personnel and equipment to carry out the washing of clay-rich hydrocarbon contaminated land with the use of organic solvent based wash fluid at a former gas works site in Jersey to enable the site to be used for retail purposes. 1000 tonnes of contaminated soil was washed during the project and the soil washing system was particularly attractive to the client since there are no hazardous landfill facilities on Jersey and there were no residual waste products from this process. Cleaned soil was used as backfill on site, cleaned water was discharged into the foul sewer and oil / solvent emulsion was sold for use as boiler fuel. The performance criteria for washed soil called for below 5000mg/kg (ppm) TPH (Total Petroleum Hydrocarbon) and below 1000mg/kg total PAH (Polyaromatic Hydrocarbon). These limits were set by the consultant based on their risk assessments relating to ICRCL. On-site and laboratory testing was carried out to determine levels of contamination in the washed soil prior to use as fill. IR testing (Infra Red) was used to measure the TPH value and GCFID (Gas Chromatography Flame Ionisation Detector) was used to measure PAHs. The plant supplied by PSD in Jersey included ultra-fine desilting equipment and a flocculation plant complete with mixing system, sedimentation tank and high capacity centrifuge. Contact us to discuss how our equipment could be used to help solve your soil washing problem.